What an absolutely wild week for Modern. Playing with Bloodbraid Elf and Jace, the Mind Sculptor legal has been incredibly exciting and exhausting. With so many shells to try, and so many changes in deck-building philosophy (particularly for control decks) I feel like I’ll never have enough time to explore all the avenues! Today’s Blue Moon list comes largely from the core of a 6-2 finish of MTGO user Gul_Dukat in the most recent Modern Challenge. 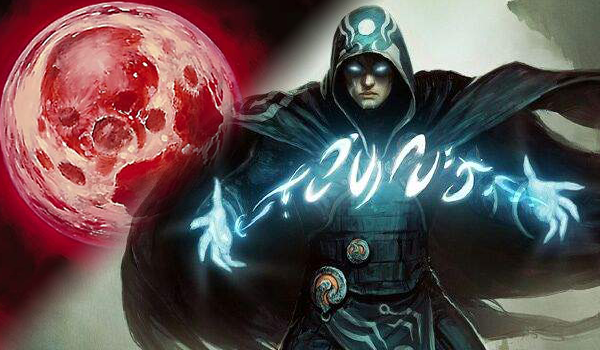 Jace, of course, is the obvious addition to the archetype, but other innovations are present. Most importantly, in my opinion, is the implementation of four Disrupting Shoal. When I first heard the rumblings of Shoal being used after the Jace unban, my initial impression was that it would be a trap. Nothing impressive, too restrictive, and altogether too cute. After my twenty or so matches with the card, I am incredibly impressed. I have been happy with it in nearly every matchup (GBx being the exception) and it has always overperformed. Whether it was countering a lethal Scapeshift, a turn-one Cranial Plating (I was on the draw), or helping me win early counter wars against Storm, it was outstanding. They incentivize tapping out for impactful threats. They require a heavy blue card count. They reward a variety of blue converted mana costs (low to the curve). It may just be me (I’m a bit biased here), but this sounds excellent for UW. Originally after the Jace unban, I became concerned about the future of UW Control because of its relative lack of ability to deal with Jace efficiently in pseudo-mirrors. UW lists will always be lighter on countermagic, and without Lightning Bolt, it is difficult to have a clean answer to a resolved Jace. Now that I’ve been shown the truth that is Disrupting Shoal, I’m very curious to find if it can help solve some of these issues in the mirror. This entire write-up became essentially about Disrupting Shoal (and less about Blue Moon in general) but it was hard to avoid! I’m genuinely excited about the future of the card in the format moving forward and I’m going to be testing a lot of shells with it. Enough about that though, you came here to see some games with Blue Moon! The deck seems cool, but why does Blue Moon need a new name, just because of one new card? Whenever we’re spotlighting new builds like this, whether in videos or Deck of the Weeks, we like to make it super clear what the deck is before you click on it. We will most likely still be calling this deck Blue Moon in metagame updates and the like. It’s probably a personal choice, some people tend to sort decks into decktypes by even the slightest change in the list, some sort decks into decktypes based on a key-core of few cards. Sometimes people base decktypes on what they think has the most focus in the meta. I feel like this list might be better off without Thing in the Ice and with more Moon. Jace alone allows the deck to win without needing to worry about devoting more slots to threats, which historically was one of the biggest problems with Blue Moon imo. Also of note is that Disrupting Shoal can be hardcast in the lategame, which comes up pretty often in this deck compared to the tempo decks that Shoal has seen play in. You don’t mind overpaying for a counterspell at that point. I concur, the Thing seems more cute than good. I’d jam a couple more Moons, the 22nd land, and the 4th Cryptic over it. Why not adding Chandra, Torch of Defiance to the party? I’m a huge fan of her especially in current meta since it helps keeping at bay other PW. And contrary to Jace and Liliana, her +1 does slowly kill hopponents. Any thoughts? jace is just better in every way. fills the same slot on the curve and is a win condition itself. chandra is a fine card, but its just outclassed on curve.